High quality cards, board and game pieces. Game instructions that are clear and easy to understand. Artwork that inspires many creative clues and hours of enjoyment by everyone. 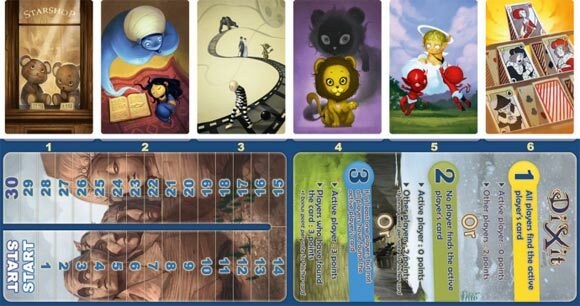 For even more options in the game-play, mix in the cards from Dixit Odyssey or any of the other versions. I game mostly with my kids. They love Apples to Apples to the point that I want to get rid of the game. After seeing this game as an explorable game and in the store, I picked it up. This scratches a lot of the same kind of itch that Apples to Apples hits, but this does it in a better way. Apples is more simple, but Dixit really executes better. Play is pretty basic (rules fit on one sheet of paper). The active player picks one of his or her cards and gives a clue for the card. The other players then pick one of their cards that fits. The cards are put together and the other players make guess (through numbered counters) which one is the active player’s card. If the active player gets all or none of the guesses, the other players get 2 points. If one or more, but not all of the other players guess the active player’s card, the active player and each correct guess gets 3 points. There are also bonus points for each of the other players who get a guess for their cards. First to 30 points wins. It’s that simple. Apples has the non-active players throw in cards to match whatever whim the active player has, and there may be no rhyme or reason to that whim. Dixit instead urges the active player to give a clue that will describe the card so at least one player picks it, but not so obvious that all the other players pick it. The other players also can keep hold of the driver’s seat by giving a card that will try to steal the guesses. This is a cool little game. It’s simple, it’s fun, and the art on the cards is really cool just to look at. I found this game at a thrift store and I’m really pleased I did because I probably never would’ve tried it otherwise. I heard it described as “Like Apples to Apples, but with pictures,” and that immediately turned me off. After having played it at game night, I have to say it is indeed like Apples to Apples. The main difference is that instead of one person choosing a winner seemingly at random, everyone chooses the winner by voting which card they think belongs to the “storyteller”. This makes all the difference and allows me to actually enjoy this game. – Pictures can be too simple and too focused to come up with a good ambiguous clue. – One play and we used almost every card already! Dixit is like Apples to Apples with pictures, but somehow it’s actually good. Dixit has it moments. It can potentially be a very fun game and it can also be a little unexciting. That all depends on the people you play with. Imagination is key and understanding the opponents psyche is important. Ultimately, its a race to the finish. The key of the game is trying to get at least one other opponent to guess your card correctly. It cant be too obvious and it also cant be too difficult. During your turn, you must try to give a clue that only one other person knows. That way, you can score your points to move your bunny ahead. All in all, it is fun game. It can also be fun to play with non-gamers I think. Or at least try to introduce them into the games. PLaying with children is also good. I rarely get to play these nowadays, mostly because my friends want to play something else. Still, a good game. Good artwork. Nice big cards. In Dixit, you have a hand of 6 cards with nicely done art work on them. One person picks one of their cards and says something that makes them think of their card. This can be a phrase, lyric, one word, whatever comes to mind. Everyone else takes a card from their own hand that they think matches the phrase, lyric, or whatever was said. The cards are randomly laid out and people bid on which card they think was the one chosen by the person who started that turn. Points are scored (not going into every rule here) and play is passed. I have played with ages 5 to 65 so far and believe it or not, younger folk are not at a disadvantage. I love this game, cards are great quality , art is great, and play is mellow and very entertaining. Dixit has a few different sets out, which I believe (can anyone confirm?) just have different art on the cards but plays the same. Either way I want to own them just to mix it up. Hope this helped some, and happy game playing. what brings me back to this game over and over is the artwork of each card. every time you give description of a card it takes on a different interpretation. the more you play the deeper it can get. i would really try and look at each card and see how in depth they are. you will be surprised what whats in each card. the speed of the game is so so. it can be fast paced or it can drag if you don’t have a timer on the decision making process. once you can get pass that, the game flows well. give it a try and i hope you have as much fun as we have with it! 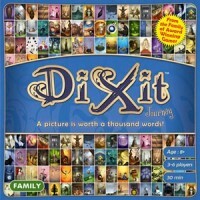 Add a Review for "Dixit Journey"